The short days of winter meant that we were spending most hours of daylight riding with little or no time to visit things once we had reached our next destination, so since Marrakech we had started to make shorter journeys and do some sightseeing along the way. Today we had a particularly short day, and planned to visit two things. 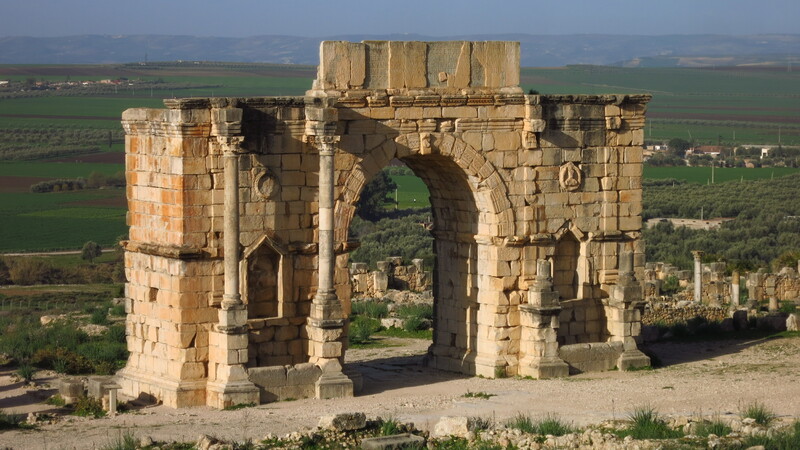 The first were the ruins of Volubilis, an important Roman settlement two kilometres out of Moulay Idris, capital of the Kingdom of Mauretaina and the actual place where Moulay Idriss I arrived in the 8th century and started Islam in Morocco, the present-day city of Moulay Idriss Zerhoun not being built until two centuries later. 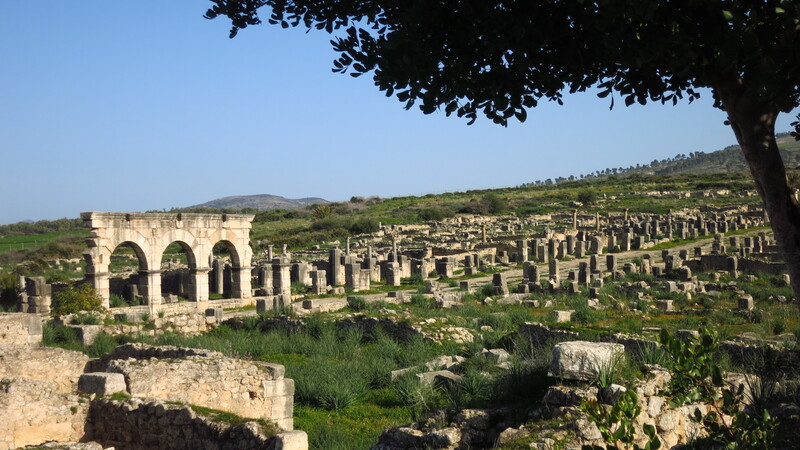 A lot of materials to build the new city were taken from Volubilis, and today the biggest remains are those of the basilica and the Capitoline temple, as well as the Triumphal arch. The city was listed as a UNESCO World Heritage Site in 1997 and at this time in the morning was deserted, which meant no other tourists and no locals trying to make some money as guides. We spend over an hour walking among the ruins, taking in the size of the city, appreciating the perfect location at the foot of the hills, between two small rivers or wadis, with a vast expanse of fertile land beyond its walls. 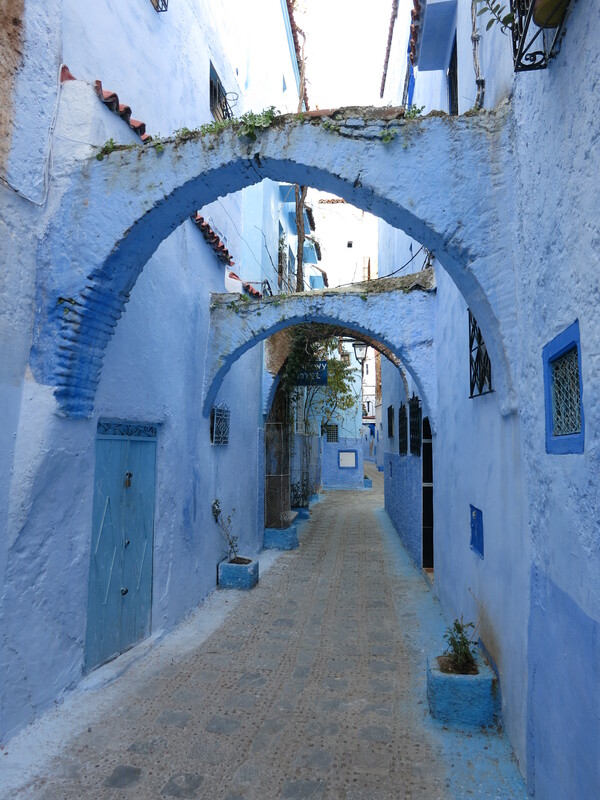 The sun was rising and with all our riding clothes on we soon decided that it was getting too hot to be sightseeing, so it was time to hit the road to get to our next destination with plenty of daylight left – Chefchaouen, the blue city. For the next hour or so the road was rather monotonous, but past Ouazzane we entered the Riff and it became much better – green valleys, winding roads, great landscape… it all made for a more entertaining journey to Chefchaouen. Once we got there, realising that it was only one o’clock and that Ceuta, where we were supposed to go the following day to spend the night before taking the ferry back home, was only a further 100km away, there was a short debate whether to stick to the plan and stay overnight in Chefchaouen or visit it fast and go on to Ceuta. 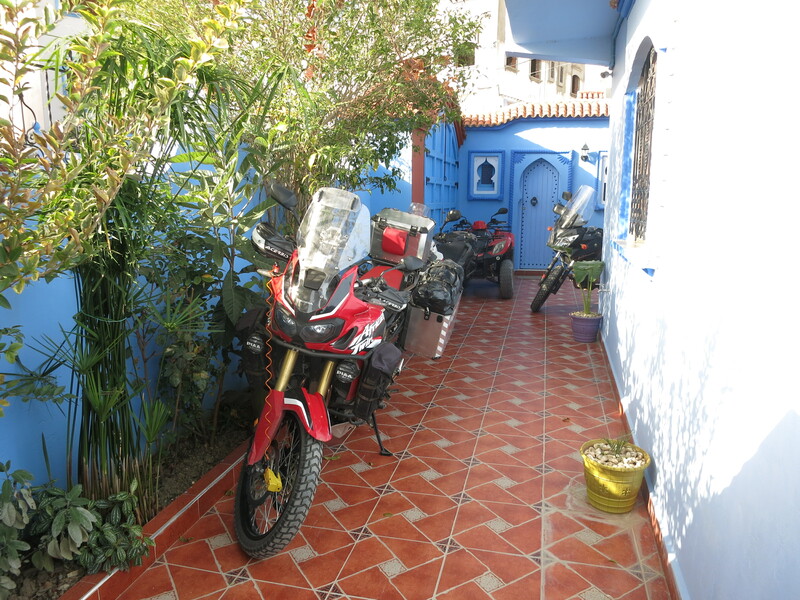 Gerard and Esteve were tired of so many days on the bike and the prospect of getting home a day earlier was tempting for them, but I wanted to visit Chefchaouen without hurry and rest a bit. 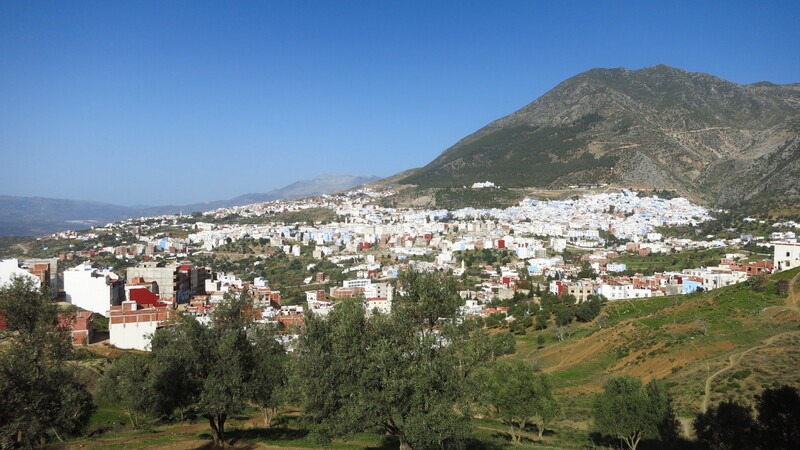 And in any case, moving things up a day meant cancelling a night’s booking in Chefchaouen, advancing the booking in Ceuta and modifying the date of the ferry’s tickets, with no guarantee that we would get our money back in any of the cases. That argument seemed to be enough to convince them to go on with the planned schedule, and we rode into the city to find our house. This time we had booked space in a place called Villa Rita, a guesthouse 15 minutes on foot away from the medina. It took us a while to find it, as there was no clear address and the GPS location was approximate, and when we knocked on the door, there seemed to be nobody there. Fortunately, after a phone call, the manager appeared and things changed for the better very fast – we had space to park the bikes inside the house, instead of just rooms we had a whole floor, a complete apartment for us, there was heating in the rooms, a fireplace in the living room, working wifi signal in all the rooms and hot water in the bath. This was by far the best place where we had stayed. 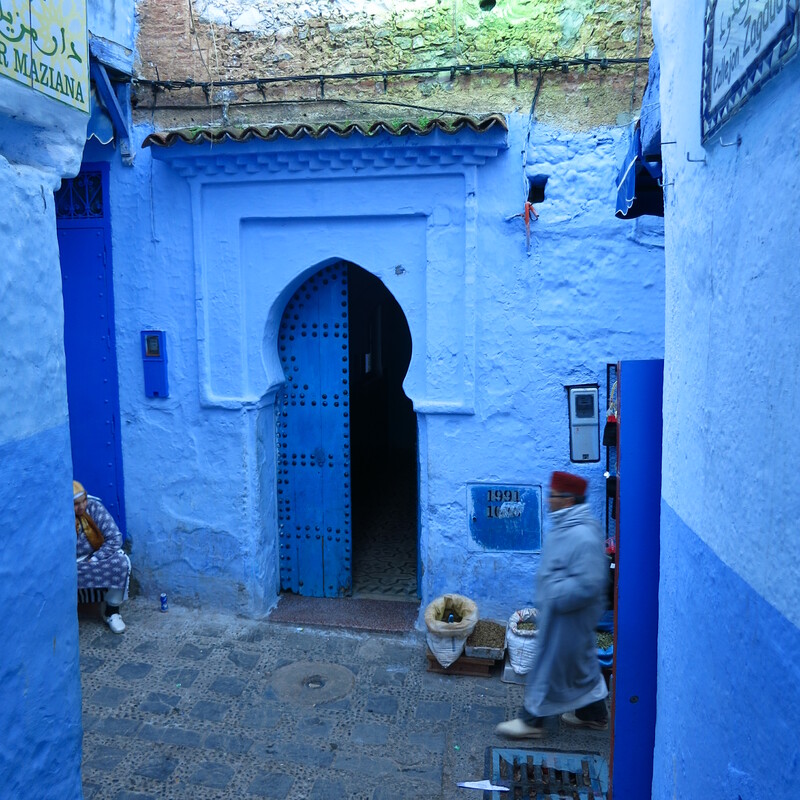 With some hours of daylight left, we went to visit the famous blue city – called so because most of its houses are painted in blue and some white, making for a spectacularly colourful medina. Locals told us that the reason is that the blue colour is supposed to keep the mosquitoes away, and the white colour has the better-known function of keeping the houses cool in the summer heat. The medina was a lot bigger than we expected and, despite being one of the biggest tourist attractions in this part of the country there were not too many people in the streets, so strolled around taking pictures until it got dark. 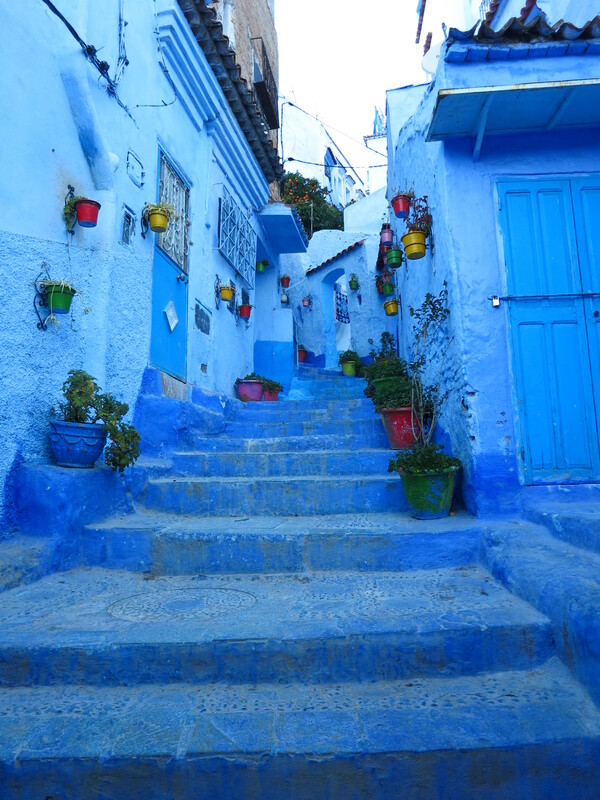 Chefchaouen is also known for being at the heart of the one of the main cannabis production regions in Morocco, and the tourists are openly offered to buy the product everywhere in the medina, as well as visits to the plantations. Contrary to popular belief, cannabis is not easy to find outside this region, and it is not legal to grow it or sell it in the country. However, centuries ago, a few families in the Rif valley were granted special permission by the King, and it still stands today. 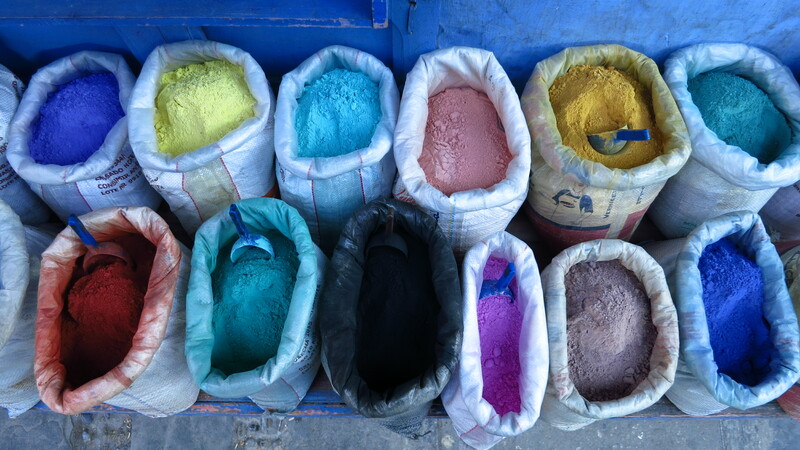 As part of our Moroccan experience, we decided to buy… Oooops, wait. This is a family friendly blog. 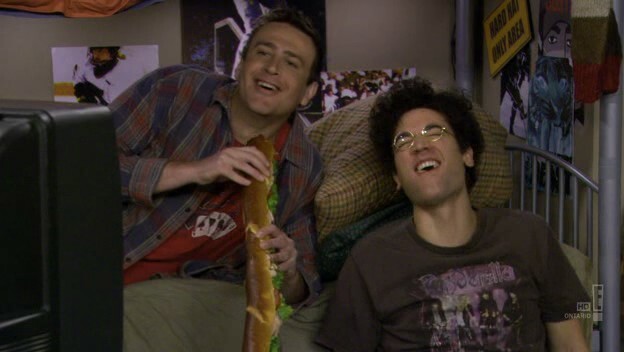 OK, as a little homage to How I Met Your Mother, let’s say that we decided to buy sandwiches from one of the guys in the main square. He went to fetch his friend, who told us to follow him to a less crowded place and immediately started talking. He told us that he was somewhat of a local celebrity, as he had appeared in a famous Spanish film in the 80s. In the film, called ‘Bajarse al moro’, two girls from a group of friends from Madrid who make some extra money selling sandwiches travel to Morocco to get some ingredients. The guy played a kid who offers to take one of the girls into the mountains to see the plantations and buy ingredients. Because he spoke Spanish, the film director also tasked him with finding all the extras for the crowd scene, and ever since, to Spanish tourists he has become a face associated with sandwiches so, according to him ‘life gave him no alternative but to go into the sandwich industry’. We didn’t want to buy stuff to make too many sandwiches, as we were on the way back and crossing the border the following day, so in the end we convinced him to sell us only a little and back in the apartment we found that the ingredients were so good that after just one sandwich we had had enough and went to bed. 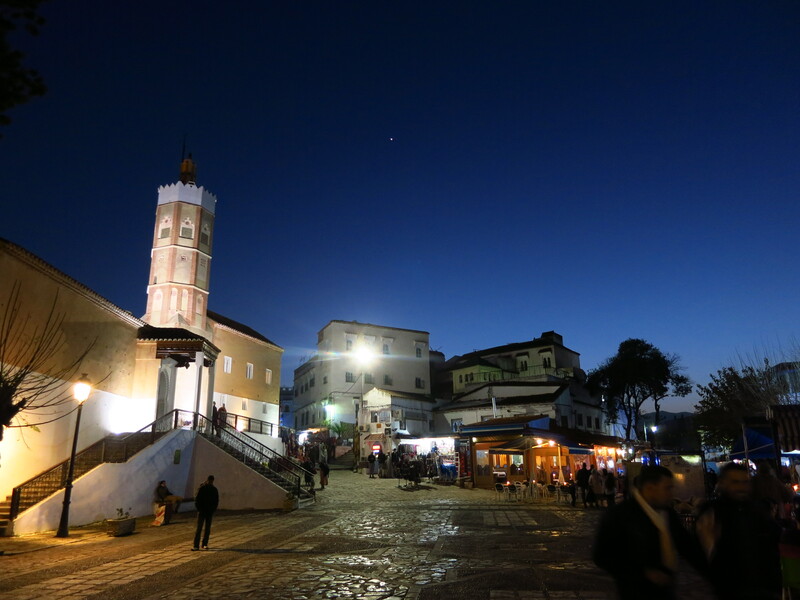 This entry was posted in Moroccan Christmas 2016, Travel and tagged Chefchaouen, Honda CRF 1000L, Morocco, Moulay Idriss, roman ruins, the blue city, Volubilis by Kilian. Bookmark the permalink.